Atomic Race Ski Poles 105cm. Condition is Used. Dispatched with Royal Mail 2nd Class. Good quality poles. Condition is Used, small scratches at bottom from wear and tear left pole strap ripped, fixable. Salomon Patrol Ski Poles. 120cm/48”. Condition is Used. Collection in person only. Kids Ski Poles 95cm. Condition is Used. Dispatched with Royal Mail 2nd Class. Scott Ski Poles. 115 cm , little bend in one but not noticeable when moving ! Condition is Used. SALOMON Ski Poles 115cm pair Blue/Black. Hardly used. See photos Have more Skis, Ski Bags, Boots and Poles in my other auctions Cash on collection or can post. Dispatched with eBay delivery – Shutl 2-3 days. Nordica Dobermann Aluminium Ski Poles 135cm. Condition is Used. Collection in person only. Unique lightweight cored out grip and strap design removes material where possible. Utilizing a 3D molded urethane right/left strap for comfort and ease of entry. Unique lightweight cored out grip design removes material where possible. Speed Lock. Adjustable Wrist Strap Which Is Excellent And Easy To Use. Rossignol Scratch Ski Poles Leather . Condition is Used. Dispatched with Royal Mail 2nd Class. 110cm Quite difficult to get hold of originally. Lovely ergonomic leather grips and cuff strap with studs. Used with scratches but not bent and still solid. Glow in the dark graphics. This high-end Alpine pole is an all-rounder and so perfect for beginners. Whether you're carving or making sharp turns: the Spark Lite S has what you need. Grip Trigger S (All Mountain - Slalom). Strap Trigger S (Vario). SKI POLES . 120 Cms . USED ONCE ONLY . Used a couple of times, but bought some new ones as a package when I bought my own skis so I no longer need these. Great condition as per photos. Not practical to post due to length and the high likelihood of them getting bent! I do travel with work so a meet may be possible, so contact me before bidding if you want to ask about that. Thanks. Here for sale is a pair of Kerma Vector Red Ski Poles. 100% of the money raised from the sale of this item will fund our animal welfare work in the community. This item has been donated to the RSPCA Leeds, Wakefield and District Branch. 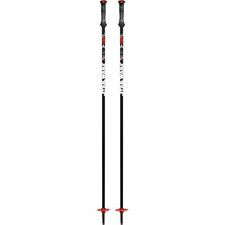 Atomic 1 Pair of All-Mountain Ski Poles, Aluminium, AMT SQS W Black/White . Leki Ski Poles - 105cm - Immaculate - 1 Day of Use. Trigger Wrist Straps.